–> While this is true, it’s not really worth mentioning anymore. Back in the times when mintWifi was designed, this was a significant innovation compared to Ubuntu. A lot of efforts were made upstream though and whether it’s by Canonical or the kernel team, the difference between Mint and Ubuntu isn’t that big when it comes to hardware support anymore. Ndiswrapper is installed by default and so is ndisgtk, and these are the two most significant differences when it comes to Wifi. –> What do people think? I was under the impression that most Twitter readers were either using the site or an RSS reader. If you think a Twitter reader is a must on the desktop then please speak up in the comment section. I definitely don’t want to clutter the list of featured apps in mintInstall, but I’m happy to add things if they’re missing. Let me know. –> PulseAudio is probably one of the most under-estimated innovations of these past few years. It’s a complete sound server and I could go on all day about why it’s absolutely fantastic. I’ll definitely try to post about this in the future. If mintCast is interested, it would be interesting for them to address the topic. Many thanks to the reviewer for such a quick response and for his feedback. The comment section is open for your feedback and I’m personally interested to know your thoughts on what’s missing in the list of featured applications. 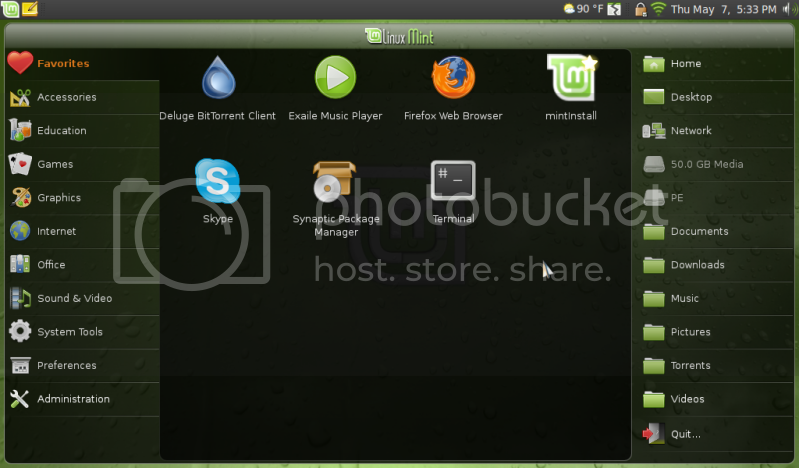 Previous Previous post: Linux Mint 7 “Gloria” RC1 released! Next Next post: Mint 7 Gloria in your language? I loaded up RC1 on my laptop last night, I’m really digging it. So far nothing earth shattering just an overall refinement and more polish. When I get off work today I’ll play with it some more, but the little I messed with it last night was very nice. My only complaint is no option like the previous releases to turn of the fortunes. Sorry but it’s just useless clutter, some people like it but I know a number like myself who don’t. I hope before the release you’ll have the option to disable it during setup like the earlier releases. i just installed Mint 7 Gloria RC 1 and i really liked the new ‘installer’ and the way it looked. the map looked great and the partitioner was excellent. i usually just click click click thru the installer but this time i read everything and just enjoyed it! fantastic job! i am now installing my favorite programs and off to testing i go. have a great day. I Havent had the chance to look yet, but once the 64bit is out I will, the only question is will there be an upgrade path from LM6? Just installed Gloria RC few hours ago……and for the moment What a work!!!! This version of linux mint is bringing it up to the top level among the others….excellent work Clem and Co….will post comments on the go. I just installed Gloria RC1 on my Asus EEEPC 1000HE. The interface is incredibly refreshing compared to Ubuntu 9.04. Netbooks don’t have enough screen real-estate for two panels. I know there’s netbook remix for ubuntu but I really just prefer the regular desktop. I’ve been using Mint since version 4 and have loved it. Keep up the good work. I always forget how much Mint does right, until I use another OS or another distro. I just installed Linux Mint 6, so far I enjoy Linux Mint! I think I have found a distro of Linux that I really enjoy! I will try Linux Mint 7 out after getting my feet wet with 6! Don’t even think to change the current colours and theme pack on this RC to the final release. Its perfect right now. I’m gonna try it on a vm… I really need a testing desktop. Congrats Clem, Husse, Exploder and the whole Mint team. I AM HAPPY LINUX MINT 7!!!! HAVE CAN BOOT LINUX MINT 7 ON MAC IMAC !!!!! Am I impressed!!! Installed it on my trusty HP Lap Top and been using it most of the day without a hitch – brilliant!! Haven’t tried the Lin4Win function yet but it won’t be long. My earlier observation about an older version of ShowFoto for Gloria was a little premature, “no sooner done than said” it would seem. Sincere Congratulations to EVERYONE involved with the latest release. thank you and your team fort the work. What I am missing is “HandBrake”. Please consider to add it in Mint 7. It is a wonderful peace of software. By the way I think the new artwork is very pretty. Why should it not be the default artwork? Hi. Thanks for your great work. A good Twitter app would be much appreciated, it’s a very good suggestion indeed. It would be a madness. You DO need a twitterclient if you’re serious about it. The good ones for Linux is Adobe Air apps though. No need for a twitter client. Mint should always be basic & minimum. It should be as lean as possible. Stunning. Another fantastic release. Thanks to all concerned. As above please keep it fast and lean, those who want to use the extras can simply download and install them as desired. Hello Clem & Hello everybody who are contributing in this great OS! I am using Mint since Elyssa, and I’m satisfied with the features, stability and with the design also. But there is one thing what could be modified somehow: the menu is too big – when I’m opening the menu it is covering the half of my monitor, earthing is appearing places, applications, system etc.. – and it is showing to much things, because of this it is enough difficult to find something – ok you can search, but it is uncomfortable – and you are loosing among the too much information. Some things / settings can be done from two places for example from control center & Administration, therefore maybe some things in the menu is also useless. My opinion is if it is possible to change the menu system, to be more simple and smaller, with higher icons. Again do not misunderstand, I like Mint, I do not criticize, I just wrote my opinion, about how can i imagine to improve further this great distro. Now, I changed my mind! What a change! Super user friendly and working fine! But I still need to use tools such photoshop. I am aware that there are app such as wine that can do the job. Is this installed in Mint by default? Thanks and good work for all the Mint team! As Shahin I find that Handbreak is a great program. Would be nice to have it in MintInstall at least. Hey, I just intalled the Gloria release. (It’s now for use on my oridinary desktop!) It works and looks great. The only issue so far is about my ATI Radeon HD 3650 AGP graphics card. It works rather good, but in some way it damages the sound from the built-in Intel 865PE/G + Reatek ALC655 sound circuits. The sound is terrible. I also added the “Compiz-Switch” to be able to use Google Earth without flickering. I suppose all these problems are about poorness in the ATI-driver? Thank you for a Great Green Good-performing release! Alternatively, use synaptic. Gwibber is now available in the Jaunty Universe repository. So I agree with reviewer that Pulse Audio is absolute useless, every time I complete removed it because I don’t see any advantage of it … so I’m wrong? Maybe features like that you can set volume for every applications are good, but what when you have external high quality sound card and with pulse audio it is absolutly same as ordinary integrated sound card… why you think that it’s useful? Is the 64 bit version coming? Can’t wait to run it. And I agree on Pulse Audio .. it’s the only server I can get to run multiple audio streams. Touch much green LOL.. he oughta try OpenSUSE, now that will put you in a coma if you don’t like green…. thank you for this nice Gloria, as alexxx24887, BL, Enoch Root said Gwibber is perfect. I use it for a while with no problems. Thank you for all the good work. Version 6 is great on the laptop, works well. Would like modem support. Hope Gloria version 7 includes Open Office version 3.0 as I had to install using a .deb from OOo’s web site. It is good to have since it opens .docx and .xlsx files. Pulse Audio is a win, I used to loose audio on my Ham Radio Application which was quite annoying. It has been more stable on the desk top using it. I teach the elderly computers at the senior center, now Mint is included. They can handle it and some prefer it, over the other o.s.! I’d rather not see a twitter client in the default install. For those users that do want it, it’s a trivial install that can be accomplished in at least 2 ways. As it is I remove a large portion of the apps that come by default anyway in favor of my personal favorites or updates versions from PPA’s. 3. “USB startup disk creator” should be included by default! I like to congratulate Clem ans his staff. I used Linux for the past couple years. I used them all almost at the end I choose Ubuntu and SUSE. But 3 weeks ago I discover LinuxMint from Distrowatch then I decided to try LinuxMint, bingo I discover what I was looking for. I like the artwork I like everything that Mint have to offer very specially the codecs by default. Guys, keep up the good work, you will be surprise how far Mint will get. Also let me know how can I donate to Mint. I am now using Gloria and it is just amazing. But I don’t really like few things about mintUpload. First, I really miss that Copy button after uploading file. Clicking URL is just not professional and it gives incomplete feeling about the tool itself. And the notification text color is way to bright. Its just very uncomfortable to look at. Huzzah! Another Mint to play with. My Mint 6 partition has taken to locking up (completely, as in requiring a full hard power off and then back on) so I switched back to Kubuntu in the 9.04 range. I like Kubuntu but I really really really like the Mint interface so Gloria it is on sda7 (/home) and sda8 (/). Mint Rocks and 7 RC1 is really great on my computer. I’m always impressed to see how well it works on my system. I’ve been using it over 24 hours with no hiccups and the wireless is MUCH BETTER on there than on 6, with many fewer disconnections. I don’t know why/how this is but I tested it to be sure. In 6 I would be disconnected at least once an hour. In over 24 hours of use on 7 I’ve been disconnected once. I can’t explain it- I just know that it’s true for me. I’m a Windows XP guy, and had tried mint 5 before. I liked it, but I still preferred to use Windows XP. Then I tried Mint 6, and I was able to make the switch to linux! I still have XP installed just in case I can’t figure out how to do something for school, but I rarely need to boot it. I’m really excited to try Mint 7. Way to go, keep up the good work. Twitter doesn’t have nearly the popularity that its users imply. In fact, it was in the news that the retention rate for new Twitter users were abysmal. Best to save that space for Nvidia drivers and the like. And while I’m on that subject, please include the proprietary drivers on the livecd. I’m not saying make them the default as I’m sure you might have some philosophical issues, but at least make it an option to boot with. Without it, the desktop screen looks screwy (think bulging tin cans) and sorry to say, the open source drivers are not up to par. At least the drivers are more useful to more people than a Twitter program. Oh and speaking of defaults, can please change the default fonts on the desktop and in Firefox? Deja Vu Sans Book, please. I don’t know what’s up with Ubuntu and their font rendering, but can we all say “BLUUUURRRRRRRRR”? On other livecds (Sabayon, Mandriva, etc. ), the font seems to be more crisp to me. Even if I change to the same font and setting as the other livecds, it still looks off. Maybe you should look at what they are doing right because it’s a mystery to me and it only happens with Ubuntu and its derivatives. I’m downloading it now and the screenshot posted looks really nice, and BTW, you can never have too much green… but orange, YUCK! Right now I’m running jaunty which I configured as closely as I could to look like mint since I couldn’t wait. Karmic is supposed to get a new theme, finally, since Canonical has a new art team dedicated specifically to this now. I’m looking forward to see what mint will do to Ubuntu’s new theme! We already have a twitter client – gnome-do + included twitter plugin. No need for clutter with more one-of programs. Could you explain pulse-audio more? The gnome-do twitter plugin looks really good. I believe it would be a very useful functionality, thanks!!! Prefer not to have a Twitter client. I have installed Mint 7 Gloria on my eeePC 1000 HEB and installed the netbook-launcher and all the goodies with it. I even made it green!! Great job! I tried Ubuntu 9.04 and was not happy! Laptop would not shut down properly, Nvidia card not dedected properly, just a mess. But has with previous Mint editions all went well. Not sure why, but keep up the great job!! a twitter client should be available in the repositories. that is the beauty of linux! you can always add or susbtract ! Freedom and beauty that is Linux Mint! Love the fresh minty flavor! Keep up your great work!